Battlestar Galactica‘s epic third season cliffhanger is among the most daring episodes I’ve seen for any television series. Baltar’s verdict, Roslin’s returning cancer and cryptic Opera House visions, vipers racing towards a battle against staggering odds… all of this would have been more than enough for any typical “cliffhanger.” However, Ron Moore and the other writers also incorporated stunning revelations that have cataclysmic implications for the rest of the series. Season 3 answered many of the series’ long-standing questions, but this final episode introduces countless more. The score obviously plays a more important role in this episode than ever before. Beginning with last week’s “Crossroads, Part I” we have witnessed Tigh, Tyrol, Tory and Anders hearing a distant piece of music that no one else perceives. It slowly drives them mad, they begin losing sleep. The hints have been there all along, (watch both these episodes a second time and you’re bound to catch them) but in the end we learn that the song is… Bob Dylan’s All Along the Watchtower!? Ok, I need to back up and start at the beginning… at least as far as my involvement with this episode is concerned. I initially learned that we would be using the song back in December, while I was busy scoring “The Eye of Jupiter.” I have to admit that my first thought was that Ron might be going crazy. However, as always, his unexpected ideas evolved into an incredible episode. While the song is among the best Bob Dylan ever wrote, Jimi Hendrix’s 1968 version is so famous and iconic that many people simply assume he wrote it. In fact, All Along the Watchtower is among the most frequently covered pop songs in history. So, you can imagine my surprise when I learned that not only would it be included in the season finale, but it was incorporated directly into the script. I knew I needed to get some more information before I could begin tinkering with this renowned song, and I needed it from the source. I had dozens of questions. What should it sound like? Which version of the song should we reference, if any? Do we want a performer who can sing and play guitar exactly like Dylan? or Hendrix? With Ron’s blessing to try out whatever I wanted, I suddenly had the most creative freedom I’d ever been offered. No temp scores, no music notes… not even any picture to score! I was on my own, free to arrange this piece in any way I saw fit. So, in early January, with nothing to lose, I set out to do my first All Along the Watchtower demo. I assumed, correctly, that the demo would be the starting point for months of discussion between myself, the producers and the network. What I didn’t realize was that everyone involved would love my version so much that the final recording you hear in “Crossroads, Part II” is, in essence, my initial idea. So how did I go about creating this unique version of All Along the Watchtower? The first hurdle to overcome was finding a singer. Fortunately, I have one in the family! My brother Brendan, professionally known as Bt4, brought his incredible talent to the track. As much as I lavished on the instrumental arrangement, it is his vocal performance that holds the whole thing together. You guys have all heard him sing before, on the first season’s Main Title, and on Season Two’s The Cylon Prisoner from “Pegasus.” I play in his band, so he owed me a favor anyway! By the way, our newest EP is really worth checking out (www.myspace.com/bt4). 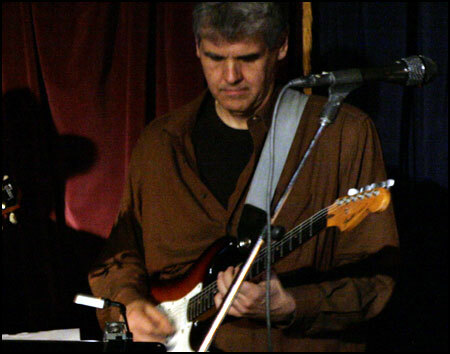 The other performer who really shines on this recording is my dear friend Steve Bartek, with whom I collaborate frequently. Steve played guitar in Oingo Boingo for nearly two decades, but if that isn’t enough to convince you he can shred, check out Black Market on the Season 2 soundtrack album. Steve’s magic is all over All Along the Watchtower. 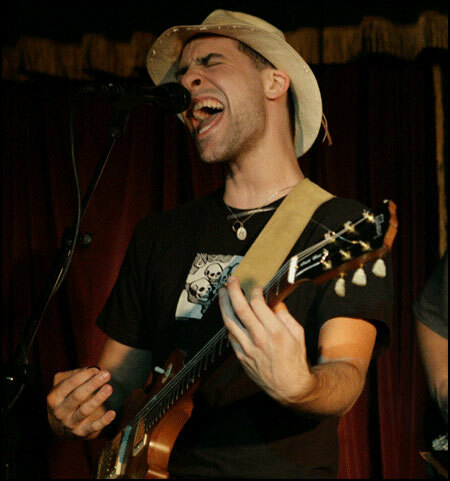 The track opens with his twangy Middle Eastern guitars, builds with his haunting electric sitar, and breaks into pounding, distorted guitar riffs. And his powerful guitar solo carries over the closing shot of the third season,whisking us through the stars to a reveal of Earth. Musically, my arrangement is almost entirely an original composition. Only the vocal melody and lyrics remain from Dylan’s piece. I initially replaced Dylan’s harmonica solos with an electric sitar. But why stop there? The entire arrangement evolved into an Indian sound, with the inclusion of tabla and harmonic minor scale tones. 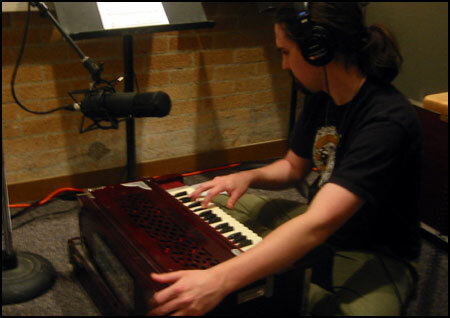 I even bought a harmonium, imported from Delhi, and laid down the drones myself. 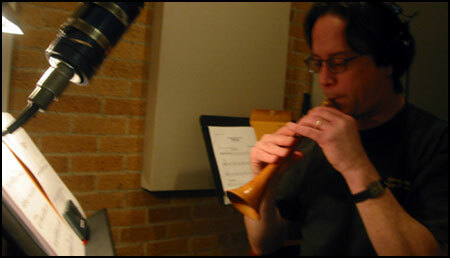 Though used in conjunction with Dylan’s melody and lyrics, this theme was composed specifically for Battlestar Galactica and permeates these final two episodes. Listen carefully to the scenes where Tigh, Tyrol, Tory and Anders hear a faint echo of “Watchtower” and you will notice that they are, in fact, hearing my original theme. Only at the end of “Crossroads, Part II” do Dylan’s musical ideas and this theme finally combine. Beneath the vocal line, the heavy-metal inspired guitar riff includes a direct quotation of this theme. Additionally, this theme shows up throughout the score on the electric sitar, harmoniums, duduk, yialli tanbur and electric violin. 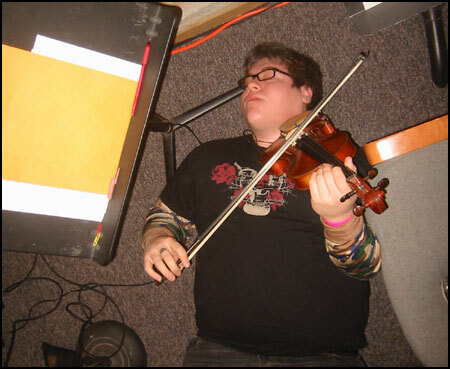 Violinist Paul Cartwright catches some shut eye during the “Crossroads” scoring sessions! But I didn’t change everything. I planted some subtle hints referencing Dylan’s original performance. First of all, the tempo is technically the same, even though I’ve subdivided the bar very differently. As a result, the musical arrangement sounds totally unique, but once the vocal enters, its rhythm and pacing are identical to Dylan’s. I also made a conscious statement with my choice of key. Dylan’s recording is in the key of C#m, most likely recorded with a capo, since the voicings of the guitar chords are high and thin. He certainly wasn’t going for a “big” sound. For Hendrix’s performance, he lowered it to Cm, to get more power out of the guitars and bass. 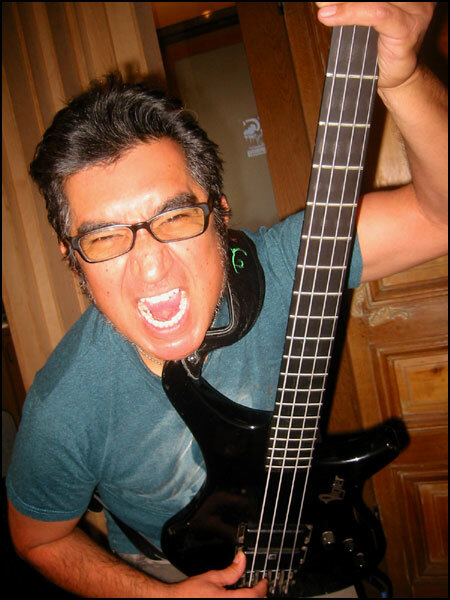 My arrangement is in the original C#m, but instead of using a capo to go UP to C#m, we drop-tuned the bass and guitars DOWN to C#m. You run the risk of the track sounding flabby and bottom-heavy, but with the right arrangement and talented musicians, this trick creates a massive guitar sound. Guns N’ Roses used to drop-tune at least a half step quite frequently, such as Sweet Child O’ Mine. Rage Against the Machine would frequently drop a whole step, as in Killing in the Name. That is the kind of depth and power I wanted to infuse into my arrangement of Watchtower, while simultaneously acknowledging Dylan’s original choice of key. All in all, I spent three months working on this piece of music. My effort certainly paid off, however. From the earliest director’s cut of “Crossroads, Parts I and II,” my arrangement was able to help the editors pace the scenes and establish the tone of this extremely unusual storyline. 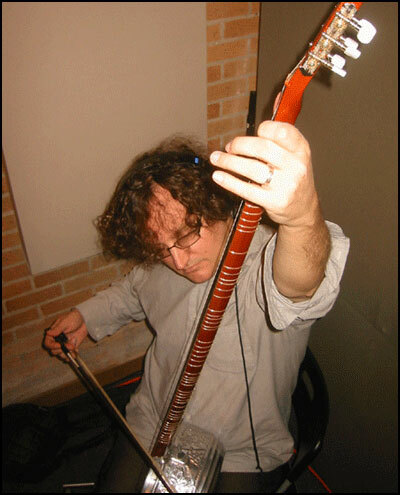 Chris Bleth plays the zurna, the loudest instrument in the entire world, and the only ethnic woodwind shrill enough to cut through a wall of electric guitars. My greatest compliment came at the dub stage. 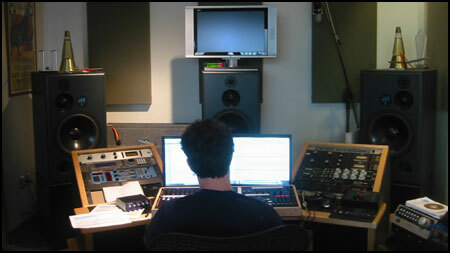 Executive producer David Eick came to listen to the final mix of “Crossroads, Part II.” We reached the scene where Tigh, Tory, Anders and Tyrol wander through the hallways, following a strange and powerful song that finally leads them to each other. The music was mixed pretty loud, but David wanted more. We watched it a second time. This time the music was BLASTING! David asked if we could turn the music up even more. The dubbers paused, looked at the master levels and said “No.” The music was so loud, it buried the needles in the red. 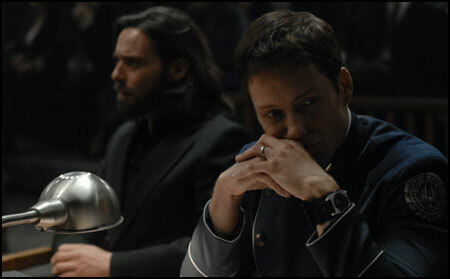 The score to Battlestar Galactica has never been as loud as during this scene. Needless to say, this made it all worthwhile! Next month, I’m in the studio working on the Battlestar Galactica Season 3 soundtrack album (which will definitely have “All Along the Watchtower” on it!). Our release date will be mid-August, to coincide with the DVD release. We’ll also be doing another live performance of the Galactica score around that time as well, so if you’re in LA, come by and check us out. Details will be posted here on my website sometime over the summer. I’ve got some other great projects on the horizon. My Wrong Turn 2 soundtrack album will be released this summer, and I’ll also be taking over scoring for Sci Fi Channel’s hit series Eureka. And of course, I’m already looking forward to scoring the recently-announced Battlestar Galactica straight-to-DVD movie and fourth season.